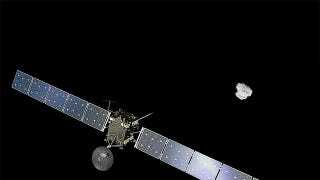 Watch Rosetta Rendezvous With A Comet, Live! It's been a long, slow trek for Rosetta to catch up to Comet Churyumov-Gerasimenko, but, more than 10 years after it was launched, it will finally meet up with its intended target within the next 16 hours — and you can watch it as it does. The ESA's livestream will begin at 0800 GMT on Wednesday, August 6th (or, Wednesday at 1 a.m., Pacific time), and you can watch along with it here. The Massive E. Coli Outbreak In Flour Is Over, So Why Are People Still Getting Sick?